The Ministry of Tourism is hosting a Small Island Developing States (SIDS) conference in Nassau February 19-20, 2014, at the Melia Nassau Beach Resort, Cable Beach. The conference is being held as the Ministry of Tourism celebrates 50 years of existence and February being dubbed Sustainable Tourism Month. Secretary general of the UNWTO Dr Taleb Rifai and Caribbean Tourism Organization secretary general Hugh Riley are expected to attend the conference. “Tourism, now more than ever, is considered a major player in world economies. Furthermore, we see tourism expanding, accounting for more and more of the income of various nations,” Thompson said. The UNWTO reported impressive growth in tourism around the world in 2013, stating that international tourist arrivals grew by five per cent year on year and the UNWTO forecasts the trend to continue in 2014.
International arrivals were up by 52 million last year, achieving a record 1.08 billon in 2013. According to the UNWTO, Asia and the Pacific regions are the big leaders in growth, followed by Africa, Europe and the Americas. “We in the Caribbean and The Bahamas must keep pace. We too must always look to grow our tourism product. However, it only makes sense to do this in a sustainable way so that we are not looking at quick success and then a sharp drop in our results,” Thompson said. To celebrate its Golden Jubilee, The Bahamas Ministry of Tourism is highlighting a different strand of The Bahamas' tourism product each month. This month the Ministry will be promoting sustainable tourism. 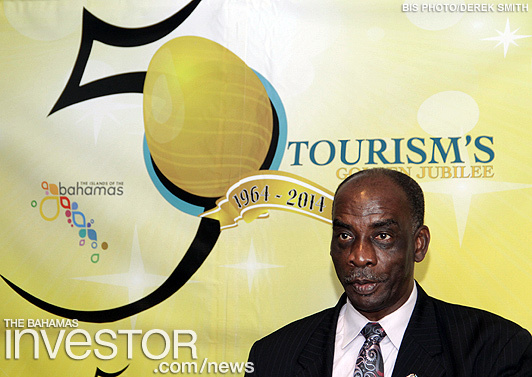 Watch an interview with Ministry of Tourism permanent secretary Harrison Thompson here. Ultrapetrol (Bahamas) Limited (Nasdaq:ULTR), an industrial transportation company serving marine transportation needs in three markets (River Business, Offshore Supply Business, and Ocean Business), announced yesterday that its management will be presenting at the Stifel Transportation & Logistics Conference in Palm Beach, FL, February 11.